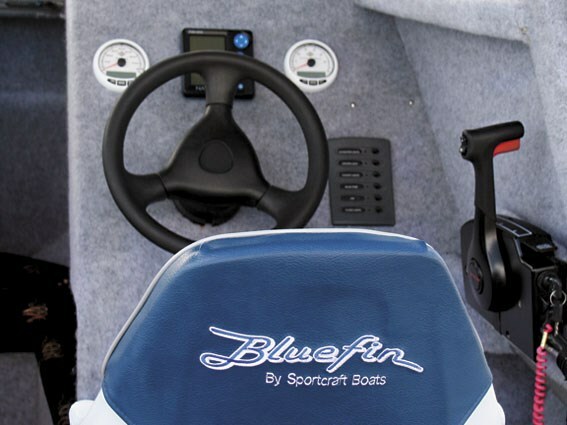 Established in 1999, Blue Fin Boats has developed a range of boats with a reputation for durability, simple functionality and stable hulls. The company's designers have focused on two complementary ranges – one aimed at the family market and one targeting the sports fishing market. The 620HT is one of the company's most popular sellers, and while it's best described as a ready-to-rip fishing platform, it's easily moulded into the role of fun, versatile cruiser for family outings. And with a sub-$50k price tag, that versatility no doubt accounts for its popularity. 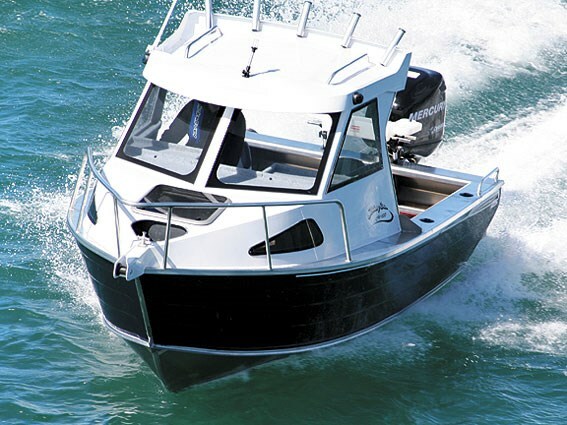 Blue Fin owners are never shy about running their boats up onto the beach or nosing them around rocky inlets – but then their confidence is supported by the boats' solid construction. The 620HT uses 5mm plate on the bottom, strengthened by 4mm folded alloy stringers running the full length of the hull. Topsides and hard top are of 3mm plate. And if that’s not sufficient for your particular flavour of fishing, the company offers an option to "upgrade" the plating. The fully-welded tread plate cockpit floor is sealed and pressure tested, a feature that gives the boat added buoyancy and also contributes to the hull's strength. For all that strength, the 620HT has fairly sleek lines. She's a handsome boat with plenty of room in cockpit and cabin, and even with that imposing hard-top, doesn't present any difficulties when being coaxed off and on to her trailer. It's ultra roomy and uncluttered (it will accommodate four frenzied anglers with ease) thanks to that fully-welded tread plate floor extending the full length of the boat. Lined shelves extend along both side for storing rods and tackle, with another unlined shelf across the transom. Centred on the transom is a removable, deluxe Bermuda bait board. The transom shelf holds the battery box and below it is plenty of room for the two tote tanks sitting either side of the bilge pump well. 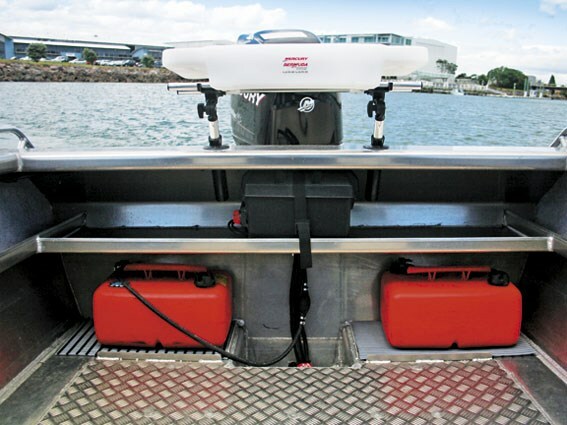 As an option, the boat can be fitted with a 90-litre stern fuel tank in place of the tote tanks. Wide gunwales hold two rod holders either side. The gunwales are also equipped with hand rails (either side) that begin about 500mm from the back of the boat and run aft, down onto the boarding step. They're ideal for holding the stern of the boat at the jetty and make excellent grab holds when boarding the boat from the water. The two stern boarding steps are separated by the outboard pod, which extends the engine aft beyond the stern of the boat – so there's good room for standing on the platform and helping to land over-size kingies. Our boat had neither a step-through in the transom nor a built-in bait tank, but as Sportscraft Boats Ltd's Darren Davies points out, "most of our boats are built to order and are customised to the clients' specifications. Step-throughs and built-in live bait tanks are definitely options." Up on the foredeck (access is reasonably spacious along the sides, with handholds on the hard top to help you along) the bow is fitted with a robust hand rail, bow roller, a small capstan and a large anchor well (no hatch on the well). Full headroom here for all but the loftiest giants. It's a cosy, welcoming spot, with lining on the sides, roof, side shelves and parcel shelf beneath the windscreen. A large lip around the parcel shelf extends back below the side windows – and provide good hand grips and security for any items placed there. In addition to the open shelves, there is also storage under the two back-to-back seats, and in a small locker in the bulkhead in front of the co-pilot's seat. Upholstered seats are comfortable and complemented by a stainless steel foot rest mounted against the bulkhead. The bulkhead also holds the instruments and switches with room in the panel above the windscreen for VHF or CD player. The boat's fishing pedigree is very apparent in the selection of grab rails strategically positioned around the wheelhouse/cockpit. They run vertically along the trailing edge of the wheelhouse sides – a great aid when clambering around the boat or when crossing troublesome bars. They're complemented by another grab rail that runs full width on the underside of the hard top's trailing edge. It helps you maintain balance moving around the wheelhouse in choppy seas. Fish are going mad – wish you could overnight? On the 620HT, you can. The cabin is fully lined and includes a berth either side which is long enough for a couple of adults – particularly if you select the optional, in-fill squab. Lined shelving runs the full length of the cabin and plenty of light is provided by the elegantly shaped side windows and clear hatch in the top. The floor of the cabin is on the same level as the cockpit and the cabin is accessed via the central bulkhead doorway. This can be closed off with a canvas cabin door – a good idea if the toilet (optional) is included. A small chop and brilliant sunshine were ideal for putting the 620HT through its paces. 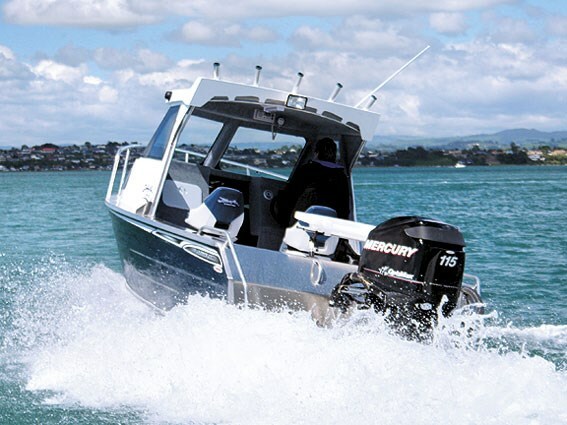 The 115hp Mercury Optimax (two-stroke, direct injection) contributed very little noise to the environment and pushed the Blue Fin along effortlessly. The lined wheelhouse softened what noise there was so conversation at cruising speed was comfortable. In the relatively calm water the speedo indicated 30mph at just under 5500rpm. At cruising speed she exhibited a tiny amount of slide in tight turns, but held a true, straight line running "no hands". To my mind, this is a more important attribute than "no sliding in tight turns". The hull has a relatively shallow dead rise at the stern (17o) and, together with the lack of running strakes on the hull, probably contributes to the tendency to slide. She has good lateral stability at rest. Despite the fishing emphasis, Mum, Dad and a couple of kids could have a lot of fun in this boat, with the little ones safely housed in the forward cabin while traveling and a nice big, safe cockpit for more sedate activities. At $46,750 for a 6.2m boat, it’s not difficult to understand their popularity.